For the Chinese university with the identical name in Chinese and Japanese, see Northeastern University (China). Tohoku University (東北大学 (東北帝國大學 prior to 1945), Tōhoku daigaku), abbreviated to Tohokudai (東北大, Tōhokudai), located in Sendai, Miyagi in the Tōhoku Region, Japan, is a Japanese national university. It was the third Imperial University in Japan and is one of the National Seven Universities. It is considered one of the most prestigious universities in Japan, and one of the top fifty universities in the world. In 2016, Tohoku University had 10 faculties, 16 graduate schools and 6 research institutes, with a total enrollment of 17,885 students. The university's three core values are "Research First (研究第一主義)," "Open-Doors (門戸開放)," and "Practice-Oriented Research and Education (実学尊重)." The origin of the university was Meirin-yokendo (明倫養賢堂, Meirin yōkendō), which was founded as a medical school in Sendai in 1736. It was reorganized a few times. Later it became Sendai Medical College (仙台医学専門学校, Sendai igaku senmon gakkō); this was the forerunner of the medical department of the university. On June 22, 1907, the university was established under the name Tohoku Imperial University (東北帝國大學, Tōhoku teikoku daigaku) by the Meiji government as the third Imperial University of Japan, following the Tokyo Imperial University (1877) and the Kyoto Imperial University (1897). From its start, it has advocated "Open-door" policies—it was the first university in Japan to accept female students (in 1913) and foreign students. In September 1907, it set up the faculty of Agriculture in Sapporo; the Sapporo Agricultural College (札幌農學校, Sapporo nō gakkō). In 1947 the university assumed its current name, Tohoku University, acquired a new Faculty of Agriculture. In 1949, the Faculty of Law and Literature was split to form new faculties of Law, Literature, and Economics. A Faculty of Education was added in 1949, Dentistry in 1965, and Pharmacy in 1972. Tohoku has been a national university corporation since April 2004. Subsequent to the 2011 Tōhoku earthquake and tsunami, the university was declared closed until further notice, but with a tentative re-opening date of the end of the following April. The Aobayama, Katahira, Amamiya, and Kawauchi campuses are all at least 12 kilometers (7.5 mi) from the ocean, towards the mountains, and therefore suffered no damage resulting from the tsunami. No deaths or serious injuries within the faculty and student body were reported on campus grounds. However, earthquake damage lead to the closure of 27 buildings and caused millions of dollars of damage to equipment. Classes have resumed normally since early May 2011 and plans for restoring, reinforcing or replacing damaged buildings are underway. 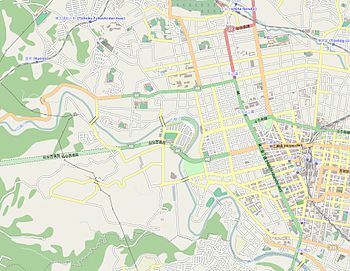 The radiology department has been actively measuring radiation levels throughout the city of Sendai since the Fukushima Nuclear Power Plant meltdown, which is about 100 kilometers south. So far no alarming levels of radiation have been detected. Amamiya campus and some institutes transferred to the new extension at Aobayama campus in April 2017. The University's Research Center for Prediction of Earthquakes and Volcanic Eruptions is represented on the national Coordinating Committee for Earthquake Prediction. Tohoku University is one of the most prestigious universities in Japan. It can be seen in the several rankings such as shown below. The university has been ranked 6th in 2009 and 7th in 2010 in the ranking "Truly Strong Universities" by Toyo Keizai. In another ranking, Japanese prep school Kawaijuku ranked Tohoku as the 5th best university in Japan. According to 2011 QS World University Rankings the university rose to 70th having dropped out of the top 100 in 2010 to 102nd, and having been 97th in the 2009 THE-QS World University Rankings (in 2010 Times Higher Education World University Rankings and QS World University Rankings parted ways to produce separate rankings). It was also ranked 49th worldwide according to the Global University Ranking in 2009. Tohoku is one of the top research institutions in Japan. According to Thomson Reuters, Tohoku is the 4th best research university in Japan. Its research excellence is especially distinctive in Materials Science (1st in Japan, 3rd in the world), Physics (2nd in Japan, 10th in the world), Pharmacology & Toxicology (3rd in Japan, 64th in the world) and Chemistry (6th in Japan, 20th in the world). Weekly Diamond also reported that Tohoku has the 11th highest research standard in Japan in terms of research funding per researchers in COE Program. In the same article, it's also ranked 9th in terms of the quality of education by GP funds per student. In addition, Nikkei Shimbun　on 2004/2/16 surveyed about the research standards in Engineering studies based on Thomson Reuters, Grants in Aid for Scientific Research and questionnaires to heads of 93 leading Japanese Research Centers, and Tohoku was placed 3rd (research planning ability 9th//informative ability of research outcome 2nd/ability of business-academia collaboration 2nd) in this ranking. According to the Qs World university rankings　on 2012/9 surveyed about the general standards in Engineering&Technology field, Tohoku university was placed 56th (world), 5th(national). As Tohoku University has been emphasizing 'practical' research, Tohoku received the top place for its number of patents accepted (324) during 2009 among Japanese Universities. Tohoku Law School is one of the most famous Law schools in Japan, as it was ranked 9th in the passing rate of Japanese Bar Examination in 2010. Eduniversal ranked Tohoku Business school as 6th in the rankings of "Excellent Business Schools nationally strong and/or with continental links " in Japan. According to the Weekly Economist's 2010 rankings, graduates from Tohoku have the 21st best employment rate in 400 major companies in Japan. Mines ParisTech : Professional Ranking World Universities ranks Tohoku University as 13th in the world in 2011 in terms of the number of alumni listed among CEOs in the 500 largest worldwide companies. Tohoku is one of the most selective universities in Japan. Its entrance difficulty is usually considered as one of the top in Japan. 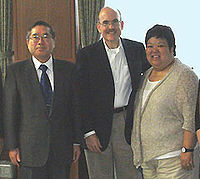 Akihisa Inoue (left) talked with James P. Zumwalt (chargé d'affaires) and Ann Kambara at Tohoku University in 2009. Masayoshi Esashi (江刺 正喜), an engineer, the global authority of Microelectromechanical systems. Yasumasa Kanada (金田 康正), a mathematician most known for his numerous world records over the past two decades for calculating digits of π.
Nobuhiko Kawamoto (川本 信彦), was the CEO of Honda Motor until 1995. Ryuta Kawashima (川島 隆太), a neuroscientist, currently resident professor, the supervisor of Nintendo DS gamesofts; "Brain Age: Train Your Brain in Minutes a Day!" and "Dr. Kawashima's Brain Training: How Old is Your Brain?" Jun-Ichi Nishizawa (西澤 潤一), the engineer known for inventing optical communication systems including optical fiber, laser diode and so forth, PIN diode and SIT/SITh. Kazumasa Oda (小田 和正), one of the most famous musicians in pop music in Japan since 1970s. Noriko Osumi (大隅 典子), the Vice President of Tohoku University (2018–), a Japanese neuroscientist. Kensaku Shimaki (島木 健作), a writer in Shōwa period in Japan. Shintaro Uda (宇田 新太郎), an inventor of the Yagi-Uda antenna 1926, the ubiquitous television antenna. Hidetsugu Yagi (八木 秀次), the mentor to Shintaro Uda and invention collaborator of the Yagi-Uda antenna 1926. ^ "30 Top Japanese Universities". Retrieved 15 July 2015. ^ a b c "ENSMP World University Rankings" (PDF). École nationale supérieure des mines de Paris. 2011. Retrieved April 29, 2011. ^ a b "History of Tohoku University Campus". tohoku.ac.jp. Tohoku University. Retrieved 7 April 2012. ^ "Important notices from Tohoku University (11:00 AM, March 14th, 2011)". ^ "IRIDeS - International Research Institute of Disaster Science". Retrieved 15 July 2015. ^ Asahi Shimbun University rankings 2010 "Publification rankings in Law (Page 4)" (PDF) (in Japanese). Asahi Shimbun. 2010. Retrieved May 11, 2011. ^ a b c d e f g h i j k l "Thomson Reuters 10 Top research institutions by subject in Japan" (in Japanese). Thomson Reuters. 2010. Retrieved May 11, 2011. ^ "QS World University Rankings 2011/12". topuniversities.com. Quacquarelli Symonds Limited. Archived from the original on 1 October 2011. Retrieved 7 April 2012. ^ "wHw͒i04.2.22j". Archived from the original on 7 May 2015. Retrieved 15 July 2015. ^ "草原名人：开创蒙古语言研究黄金时期的清格尔泰 (zh) Cǎoyuán míngrén: Kāichuàng ménggǔ yǔyán yánjiū huángjīn shíqí de qīng gé ěr tài [Famous man of the steppe: Chinggaltai, who pioneered the golden age of Mongolian language research]". People's Daily. 2007-07-19. Retrieved 2010-06-02. ^ Garcia, Alejandro V.; Cowles, Robert A.; Kato, Tomoaki; Hardy, Mark A. (2012-05-01). "Morio Kasai: a remarkable impact beyond the Kasai procedure". Journal of Pediatric Surgery. 47 (5): 1023–1027. doi:10.1016/j.jpedsurg.2012.01.065. ISSN 1531-5037. PMC 3356564. PMID 22595595. Wikimedia Commons has media related to Tohoku University.